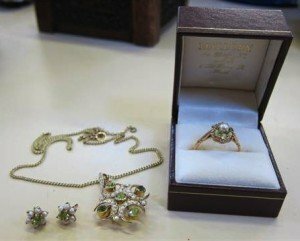 A suite of 9ct gold, seed pearls and perido jewellery, comprising a pendant on chain, cluster ring and pair of cluster earrings. 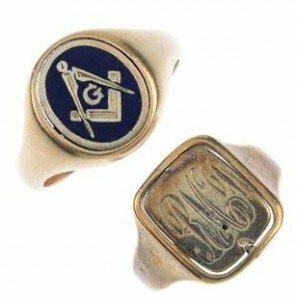 Two 9ct gold enamel swivel Masonic rings. The first with rectangular-shape monogrammed and blue enamel swivel panel, the second with oval-shape blue enamel panel, each depicting a set square and compass, to the tapered band. Hallmarks for 9ct gold. 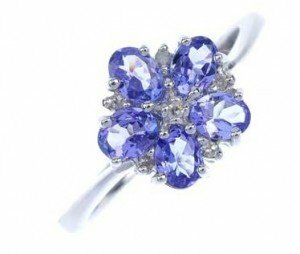 A 9ct gold tanzanite floral cluster ring. The single-cut diamond, within an alternating oval-shape tanzanite and single-cut diamond petal surround, to the tapered band. 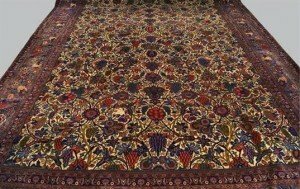 A silk Tabriz carpet, late 20th Century, with indigo palmette and bird decorated pole medallion in an elaborate floral and foliate rose colour field. 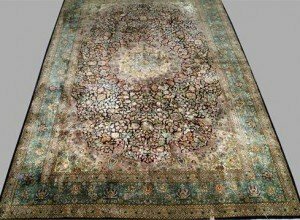 A Tabriz silk rug with pole medallion in an indigo floral and foliate field and with sea green foliate decorated main border. 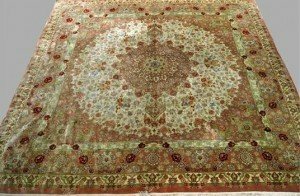 A Tabriz silk rug with pole medallion in an ivory field, with rose coloured spandrels and floral decorated main border. 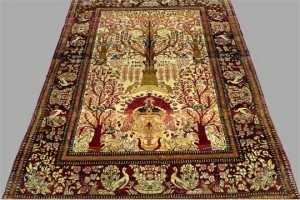 A West Persian pictorial rug with trees of life, animals and birds in an ivory field and with peacock decorated red border. 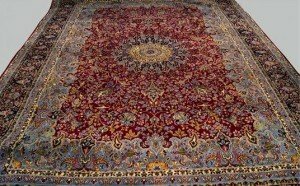 A Kashan carpet the ivory field with all over design of entwined vines, the blue vine pattern border with guard stripes. 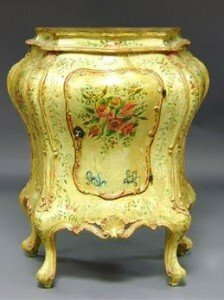 An Italian painted bombe cupboard, 20th century, with single door, overall carved with scroll and shell ornament, on cabriole legs, decorated with floral paint work. 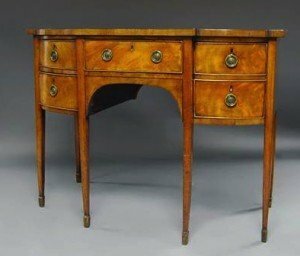 A George III mahogany sideboard, 19th century, with a break front top, with central frieze drawer flanked by two rows of drawers, one for a cellarette, on square tapering legs, with spade feet. 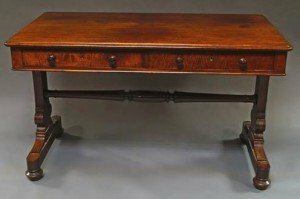 A Victorian mahogany side table by Holland & Sons, the rectangular top above two frieze drawers with ring turned stretcher on shaped supports to turned feet. 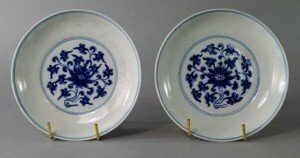 A pair of Chinese porcelain saucer dishes, 19th century, painted in underglaze blue to the central medallion with a lotus bloom issuing floral scrolls within two double rings, and decorated to the underside in a similar manner, bears underglaze blue Qianlong mark to base. 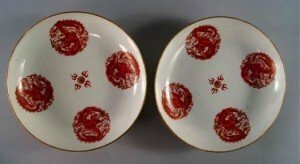 A pair of Chinese porcelain dragon medallion dishes, Republic period, each painted in overglaze iron red with four medallions depicting four-clawed dragons clutching a flaming pearl, bear iron red Daoguang seal marks to base. 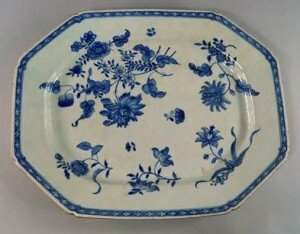 A large Chinese export porcelain meat platter, late 18th century, of canted rectangular form painted in underglaze blue with sprays of blossoming foliage. 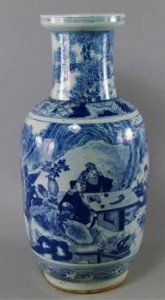 A Chinese porcelain rouleau vase, 19th century, painted in underglaze blue with two elders taking tea in a continuous garden landscape. 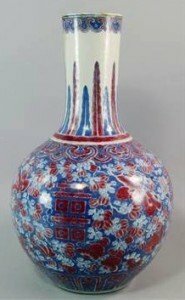 A Chinese porcelain bottle vase, early 19th century, painted in underglaze blue and copper red with butterflies and double happiness symbols amidst blossoming branches inside a border of lappets and ruyi heads, with vertical still leaves to neck and a ruyi border beneath upper rim. 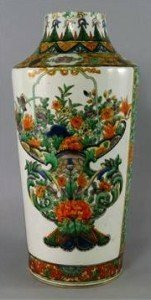 A Chinese porcelain famille verte cylindrical vase, 19th century, set with two panels decorated with a vase of flowers on a ground of scrolling chrysanthemum blooms. 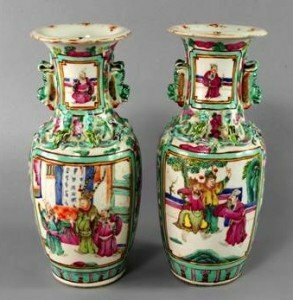 A pair of Chinese Canton porcelain baluster vases, 19th century, each painted in famille rose enamels with panels of figures in interior and garden scenes on a ground of floral sprays, applied with chilong dragons to shoulders and lion handles to neck. 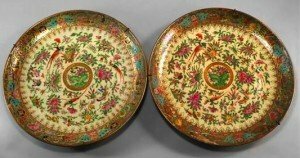 A pair of large Chinese Canton porcelain chargers, 19th century, each painted in famille rose enamels with birds and butterflies inside a border of bats, birds and foliage.